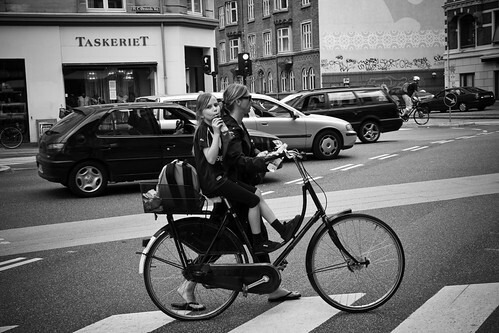 Been a while since we've featured some Copenhagen Supermums. here in mozambique sometimes we see mums on the street cycling and their babies are close to them on a typical textile called "capulana" that they use to tie the babies. it is most seen at the countryside. What's the kid in the last photo sitting on? Is it just a really big saddle? 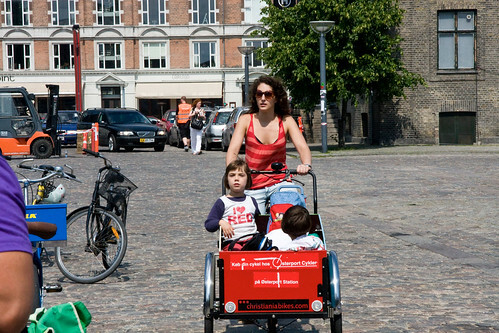 Also, do children usually sit at the front on tricycles in Copenhagen (as in the first three pictures)? I've not seen cycles used like that before - all I've seen (in the UK) are children sitting in rear chariots attached to normal bikes. 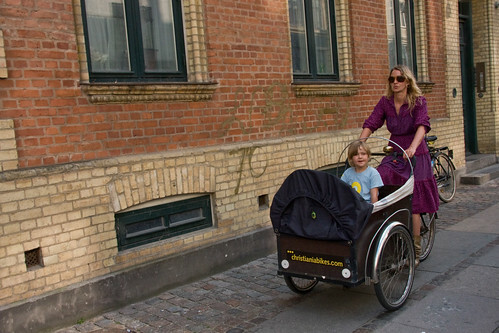 cargo bikes in copenhagen - there are roughly 30.000 of them are almost all front-carry models. there are about 12 different brands. some people use those 80's trailers, but largely it's the cargo bike. the girl in the last photo is just sitting on the saddle whilst her mum pushes the bike. 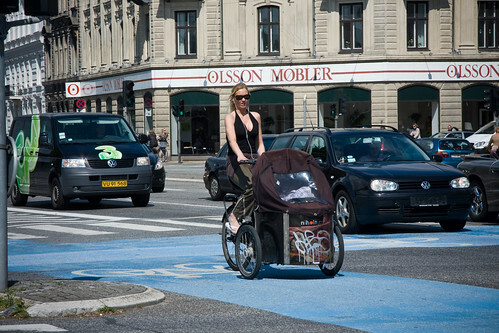 Is Søtorvet the greatest place in the world for cycle chic? I think so. Of course, it is the perfect way to drive your kid around in the city. Here you can see an example of it. When I was a child, around 1950, I sat on a saddle on the crossbar of my fathers bike, but behind my mother on a rear saddle. you know I always love a good supermum roundup. Keeps me going although here in the US the cargo bike is picking up steam. I have an old HS friend telling me she and her husband want to buy a Sorte Jernhest. George, The Mum is walking. Probably the kid was just tired or wanted to enjoy the drink without spilling. Lovely snaps. Kids in trailers (at the rear) stare at their mom's or dad's arse, and below that, at night, a red light of some sort. Ick. Those really are supermums.....those carts/bikes aren't exactly the latest/greatest in lightweight biking technology! Impressive. Quick question. At what ages can kids start to ride with their parents in those carts? there's no age limit. babies as young as a couple of months old lie in this in their lift.